Hannah Bradstock was terrified of heights, but to celebrate her 30th birthday, her husband Tony surprised her with a flight in a small Cessna aeroplane. Hannah loved it. In 2015 the couple celebrated the birth of their daughter Jinnie, before their lives were turned upside down 18 months later when Hannah was diagnosed with metastatic bowel cancer in March 2017. After an immensely strong and brave battle, Hannah died in November 2017. 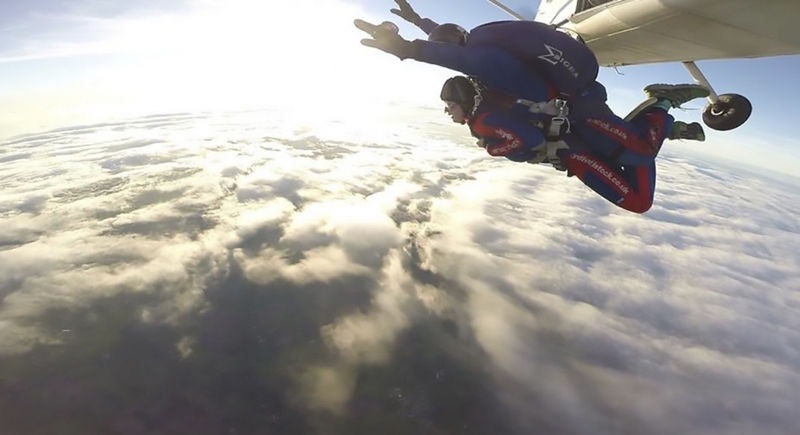 To mark what would have been her 35th birthday, Tony and two of Hannah’s closest friends, Sally Dutton and Sarah-Ann Smith, did a sponsored skydive from 10,000 feet. Everyone at St Michael’s would like to give a heartfelt thank you to Tony, Sally and Sarah and to everyone who sponsored their remarkable tribute to a much-loved woman.